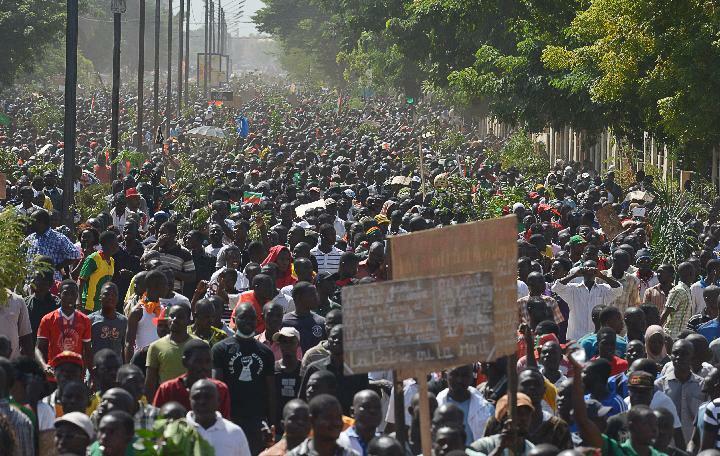 On Tuesday, hundreds of thousands of people turned out in the streets of Ouagadougou to protest a plan to remove terms limits ahead of next year’s presidential election in Burkina Faso. Blaise Compaore has held that country’s top office for 27 years by way of a 1987 coup and four subsequent elections that have not been fair, and his party dominates the legislature for the same reason. Tuesday’s protests are part of a wider and ongoing wave of actions that includes a general strike and stay-aways from schools and universities. A similar wave of protests occurred over several months in 2011. The state’s efforts to repress those challenges killed several people on at least two occasions, and virtually nothing changed in their wake. So, will the latest protests in Burkina Faso coalesce into a sustained campaign, or will they soon peter out? If they do coalesce, will that campaign spur significant reform or even revolution, or will it dissipate against repression, redirection, and resistance from incumbent power-holders? The truth is, no one really knows, and this uncertainty is not specific to Burkina Faso. After decades of thoughtful research, social scientists still can’t reliably predict which bouts of unrest will blow up into revolutions and which won’t. We can say some useful things about which structural conditions are more conducive, and thus which cases are more susceptible, to sustained popular challenges. A study I co-piloted with Erica Chenoweth (details forthcoming) found several features that can help assess where nonviolent campaigns are more likely to emerge, but the forecasting power of models based on those features is not stellar. Efforts to develop predictive models of civil-war onset have achieved similar results. Once unrest starts to burble, though, we still don’t understand and can’t model the ensuing process well enough to reliably predict which way it will tip. Across many cases, a simple base-rate forecast will produce very accurate results. Keep betting on the persistence of the status quo, and you’ll almost always be right. If you’re trying to predict what will happen in a specific case at a specific juncture, however, it’s still hard to improve much on that crude baseline. This persistent uncertainty can be maddening. Lots of smart people have spent a lot of time studying and thinking about these processes, and it feels like all that effort should have yielded bigger gains in predictive power by now.
.@dtchimp what conditions, the violence would be a whole lot less likely to occur. Uncertainty abt the phenomenon is a key cause thereof. And it’s not just uncertainty about the potential for harsh state repression, which is what I took Phil to mean by “violence.” Uncertainty about who else will turn out under what conditions, what forms that violence will take and exactly whom it will directly affect, how challengers will organize and adapt in response to those events, what changes in policy or institutions those actions will produce, and who will benefit or suffer how much from those changes are all relevant, too. In short, the rare political “events” we wish to predict are shorthand for myriad interactions over time among large numbers of heterogeneous individuals who plan and learn and screw up in a changing environment in which information is inevitably incomplete and imperfect. The results are not random, but they are complex, in both the conventional and scientific sense of that term. If we could reliably foresee how things were going to go, then we would adapt our behavior accordingly, and the whole thing would unravel before it even started. Under these conditions, central tendencies can and do still emerge. A small but growing body of work in political science shows that we can use structural patterns and observations of leading-edge activities to smudge base-rate forecasts a bit in either direction and achieve marginal gains in accuracy. Systems that properly elicit and combine forecasts from thoughtful crowds also turn out to have real predictive power, especially on short time horizons. Still, the future trajectories of individual cases of incipient revolution will remain hard to foresee with accuracy much beyond the banal prediction that tomorrow will most likely resemble today. That persistent fuzziness is not always what politicians, activists, investors, and other interested or just curious observers want to hear, but on this class of events, it’s probably as clairvoyant as we’re going to get. In a recent piece for Think Africa Press, freelancer Peter Dörrie surveys politics in Burkina Faso and concludes that the authoritarian elites who’ve held power there for the past 25 years are unlikely to let their grip slip before or by way of elections due in 2015. The reason for this pessimistic view is simple. There is no opposition movement in Burkina Faso capable of harnessing the disillusionment and frustration of the general population. Most opposition leaders have either been co-opted by Compaoré at some point in their career or have proven themselves unable to rally significant support. Moreover, large parts of Burkinabé society still follow the judgements of their ‘traditional’ rulers who have essentially been bought by Compaoré with political and economic incentives. What remains of the political opposition is fractured and unwilling to cooperate. I don’t want to pick on Dörrie, whose analysis is always thoughtful and well researched, and whose conjectures about Burkinabé politics sound reasonable to me. I do, however, want to use his piece as the jumping-off point for some ideas that have been rattling around in my head for a while about the relationship between organized oppositions and prospects for political revolutions. Dörrie’s essay is hardly the first piece of political analysis in which I’ve seen the idea that an opposition needs to get organized before a revolution can occur. Recently, it’s also popped up a lot in analysis of post-election protests in Russia and of the potential for radical change in China. This idea makes sense in a Newtonian model of politics, in which causes must clearly precede effects and change is thought to unfold in distinct sequences that repeat themselves across many cases. As someone who’s probably made this argument myself at one time or another, I’d say the mental narrative goes something like this: By definition, revolutions occur when challengers topple rulers by extra-legal means. For that to happen, a challenger has to exist and be strong enough either to defeat the ruler’s defenders or to dissuade them from fighting back. In all but the weakest states, that kind of strength requires sustained, large-scale organization. Ergo, the odds of a revolution occurring are substantially lower in societies with disorganized oppositions than they are in ones with well-organized challengers, and the organization of a formidable opposition movement is an early milestone past which all revolutions must travel. But what if the world doesn’t really work like that? Having watched a bunch of these things unfold in real time, I am now convinced that it’s more useful to understand revolutionary situations as an emergent property of complex systems. One of the features of complex systems is the possibility of threshold effects, in which seemingly small perturbations in some of the system’s elements suddenly produce large changes in others. The fragility of the system as a whole may be evident (and therefore partially predictable) from some aspects of its structure, but the timing of the revolutionary moment’s emergence and the specific form it will take will be impossible to anticipate with any precision. In this version of politics, the emergence of rival organizations is as likely to be a consequence of the system’s failure as a cause of it. In fact, that particular cause/effect distinction might not make sense at all. When surveying authoritarian regimes to contemplate which ones are most susceptible to revolutions, we may be better off thinking of the development of new political organizations and the breakdown of old authority patterns as two aspects of a single, many-faceted process in which the former doesn’t have to precede the latter and sometimes even may not occur at all. Looking at some of the cases from the so-called Arab Spring, I think it’s clear that authoritarian regimes rarely collapse in the tidy sequence our Newtonian models lead us to expect. In Tunisia, where Ben Ali’s regime had successfully suppressed the organization of any independent opposition for many years, politics swung from the routine to the revolutionary in a matter of days, and upstarts had to scramble to organize for elections after Ben Ali was already gone. In Egypt, the Muslim Brotherhood had built itself into a large and capable organization in spite of a steady diet of state repression, but the Brotherhood played only a modest role in the unrest that led directly to Mubarak’s ouster, which probably could have happened without it. In Libya, a loose assemblage of local militias managed to topple and kill longtime ruler Moammar Ghaddafi with a helpful shove from foreign countries, but many of those militias only sprung up and got organized as the conflict intensified, and to this day they remain disorganized and even combative at the national level. From this quick survey, we can tell that a linear and sequential mental model of authoritarian breakdown isn’t very useful for predicting or explaining what actually happens in many real-world cases. The presence of an uncooperative opposition that can get and stay organized in spite of state repression probably is a useful marker of some near-term potential for regime breakdown, but that doesn’t mean that the inverse is also true. In the non-Newtonian politics of the real world, we should not mistake the absence of a formidable opposition for a sign of the regime’s resilience, and we should sometimes expect to see new political machines scrambling to organize as or only after regimes fall apart, too.